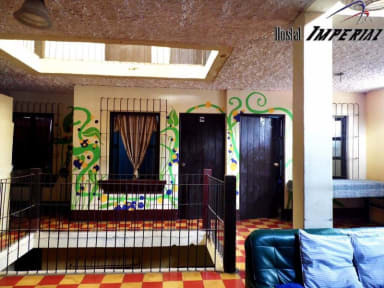 Hostal Imperial is a 3-storey house located in Antigua Guatemala. At Hostal Imperial there is a family atmosphere and safe, we provide the attention that the customer deserves. The property has red façade and very colorful inside. We share flags of different countries, like memory of the guests who leave us a piece of their city. The property offers its guests free Wi-Fi access, a common use TV lounge and a shared kitchen. Guests can cook their meals in the shared kitchen from 8 am to 9 pm. We are in a very location, two blocks and a half from the central park, and one block from the central market. Perfect location for your stay and the property is easily accessible. We have 43 beds, it consists of 5 double rooms with private bathroom, 9 double rooms with shared bathroom and 15 bunk beds, rooms with window, ventilated and clean. And also we have lockers service for free. Fantastic place - staff very attentive, sorted everything out that I needed, very flexible with any changes! Full marks A++! 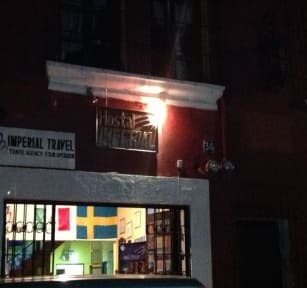 Great location, staff was friendly, close to Antigua's main tourist sites (e.g., La Merced Church, the Arch, Central Park, Market), price is cheap compared to other hostels. Cheap but clean and comfortable. Paid the same for a private room I would have for a dorm bed elsewhere. Its a nice place to stay, with good beds and good showers. But the staff didn’t seem very helpful and we didn’t like the curfew. This place was ok, nothing specific stood out as being horrible or exceptional. It had a slow feel and nowhere super comfortable to hang out inside. The patio on the roof was cool and has a great view of Agua. There is only one bathroom/shower for everyone on the middle floor. Everything was livable, but it wasn't quite what I'd expected for such a highly rated hostel. I wouldn't recommend not staying here, but there are hostels I enjoyed a lot more (Adra or Mama Papaya). A bit disorganized, we weren’t given the rooms we had booked and had trouble with the bills. I wouldn't stay here again. The beds were terrible. There was only one bathroom. Which was shared with I don't know how many rooms. Every time I went to use it someone was in it. There was some confusion with the exchange rate or something as I ended up paying more than I originally expected.